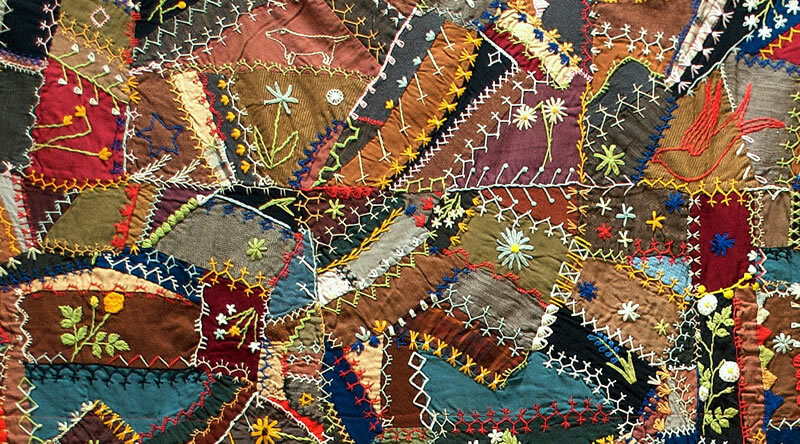 There are many quilt patterns, some as regular as the one shown above, and others, the "crazy quilt" made of whatever snips and patches were available (see here for an example). A quilt could be the occasion for a social gathering. On the American frontier, there were few forms of entertainment and a quilting bee made a welcome occasion to get together with neighbors. We had our first quilting party, at the hospitable house of Joel Strawn late in the fall of 1835. He had a large field of corn unhusked, and as it was late in the fall, the old gentleman called for volunteers to husk corn that day while the girls did the quilting. We were all very brave and enlisted to a man, but the girls interfering and urging so strongly that I had not been used to such work, succeeded in having me rejected, they claiming that they wanted an errand boy. The boys did a good days work husking corn, for which father Strawn was very thankful, and I enjoyed myself hugely with the girls quilting, but when they came to examine my work they frequently found some of their sleeves sewn fast to the quilt. Quilts served many functions besides the obvious use on beds. For families moving west on the frontier, quilts were used to cushion breakables, to cover over gaps in the wagon to keep out the wind and dust, or to provide a bit of padding on the hard seats. After arrival, quilts had uses other than as bed coverings. They could cover windows, protect against drafts, and be hung to partition off a room. In 1832 the Black Hawk War, a conflict between the United States and Native Americans, caused unrest in northern Illinois. Word came that 15 people, including women and children, had been killed at Indian Creek, about ten miles from Dayton. John Green's house at Dayton was defended by a wooden palisade around it and families for miles around came there for protection. Fearing that arrows could penetrate cracks in the defenses, quilts were tied over the fence to block up any holes, one of the more unusual uses for quilts. Quilting continues to the present day and those whose grandmothers and great-grandmothers spent the winter with the quilting frame set up in the spare room have treasures indeed. Wonderful, Candace! One of my major (i.e., never-ending) projects is to document the ties of family and community on an 1879 signature quilt made by the sewing circle of the Gravesend Reformed Dutch Church (Gravesend is now a part of Brooklyn, New York). There are 133 names on the quilt’s 132 blocks (one block has two names). Most of them are related to the recipient by blood or through marriage. Others are fellow members of the congregation. Some are just plain mysteries. But someday I’ll have them all figured out! That signature quilt sounds fascinating, Joseph! I wonder if all of them did contribute to the actual sewing of the quilt or if some were “in memoriam” type entries. Jesse’s story did make me laugh. I don’t suppose there are many diaries or memoirs out there that recorded everyone attending a sewing circle, but wouldn’t that be a great resource for our one-place studies. Except for the handful of mystery names, I’ve determined that everyone on the quilt was alive at the time of its creation. It was presented to one woman (whose name appears near the center). The names are written in ink on white muslin squares at the center of each block. There seem to be only 3 or 4 distinct hands, so these are not signatures.